We are authoritively informed, by a career politician whose education is in English with expertise in 18th and 19th Century Romantic poets with life experience in the bureaucracy of council housing, as an MP, and as a Labour government minister responsible for Culture, Media and Sport that we are experiencing "the wrong type of rain". Goodness! I don't suppose that is anything to do with The Environment Agency's Roy Stokes telling us to build snowmen to stop flooding? - they had to tell everybody later that it was intended as a joke. Tut... at the least they could have elaborated all the 'elf 'n safertree implications and included a tick box risk assessment form - falling down on the job as usual. 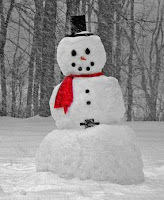 Build snowmen on a mass scale? Has there been no consideration of the health and safety aspects? What if the wrong type of snow is used? Will the mass construction of these snow people - surely in the 21st century they should be gender neutral - create nationwide shortages of carrots, coal, hats and gloves as they are used as accessories?What if even only a small percentage take to the skies? Has Aled Jones been consulted? We've seen the video evidence. We know it can happen. This is a potentially dangerous plan, so take care out there! We'd suggest that Chris Smith is put out to grass ASAP to concentrate on his poetry... where he just might have some detectable talent. That he is being paid £110,000 a year for less than one day a week to trumpet this kind of bilge and also not even bothering to properly answer letters complaining about the actions of his civil servants .... priceless. Build snowmen looking at this lot they would even get that wrong.Mind you if you got the licence they would all build snowmen so you could not generate!What a waste of water resource. What planet are they on. Are we really paying these people. THREE AND A HALF years nearly took the money accepted the contract, screwed you over,kept the money,and continue to put the finger up at the LAW OF THE LAND accountability. They are like superman they have arbitrary POWER..... we believe in justice CHRIS HUHNES yours is coming, lies and deceit just like the EA every dog gets its day. Perhaps Lord Smiff could write an epic poem? A bit of doggerel wouldn't be out of place at The Environment Agency it would seem. Just come over from RAEDWALD what a read. I had similar trouble with the\F---ing EA do not trust the Ba----ds even at the top.